PEORIA—Steven L. Austin, 63, of Peoria, passed away at 4:45 a.m. Tuesday, October 2, 2018 at his residence. Born October 4, 1954, in Peoria, a son of Harold and Marjorie Johnson Austin, Steven married Janice Lemkemann November 10, 1979 in Dunlap. Surviving are his wife, Janice of Peoria; one son, Stephen Austin of Castle Rock, CO; one daughter Stephanie (John) Mabee of Peoria and one brother, Jon Austin of Jacksonville, IL. 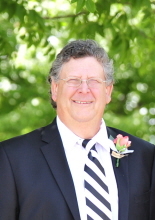 Steven worked for the City of Peoria, thirty-four years, retiring as a Civil Engineer and Land Surveyor in 2012. He was a member of the Illinois Professional Land Surveyor Association. Steven enjoyed working on cars and assembling scale models of cars. He liked pizza and was an avid Chicago Bears fan. Memorial services will be at 7 p.m. Thursday, October 4, 2018 at The Wilton Mortuary where visitation will be from 5 to 7 p.m. Reverend Howard Love will officate. A Celebration of Life will be from 5 to 8 p.m. Friday, October 5, 2018 at the East Peoria Boat Club, 707 Collins Lane, East Peoria, IL. In lieu of flowers, memorials may be made to The Dax Foundation, PO Box 506, Washington, IL 61571. "Email Address" would like to share the life celebration of Steven L. Austin. Click on the "link" to go to share a favorite memory or leave a condolence message for the family.